Those who know the Mafia only through the media will probably have trouble believing that the Mob goes to great lengths to avoid violence. Surprisingly, the criminal characters who preside over sit-downs are fair and judicious in their judgments, which is the reason the sit works and remains revered. All day long, mobsters bump heads on the street. Every beef is brought to the table, from a stolen bottle of whiskey to a billion in stolen bonds. People fight over everything, especially when there’s money involved. Aside from money, the sit can settle a beef over a man’s reputation, a question of respect, even squabbles between mobsters’ wives and daughters. I once took part in a sit-down I’ll call the “Breakfast Beef.” This street guy named Bruno woke up with a hangover and ordered his wife to cook him breakfast. His wife smelled another woman’s perfume on his clothes and slapped him across the face with a slab of raw bacon. Bruno, in turn broken a dozen eggs over her head, then repeated his order to make him breakfast. His wife, shells stuck in her hair, yoke on her face, began to fry the bacon. While the bacon sizzled, she called her brother, Joey, a street guy in my crew. Joey lived nearby and showed up at her house minutes later. Almost immediately, Joey and Bruno began fist fighting in the kitchen. At some point, Bruno was hit with the hot pan of bacon grease and suffered serious burns. When Bruno got out of the hospital, he wanted Joey dead and put in a beef. I sent Joey into hiding and defended him at the sit. According to Mob rules, Joey was permitted to defend his sister, but Bruno argued that Joey, by burning his face, had gone too far. I argued that Joey’s sister, not Joey, hit Bruno with the grease. After all, I said, Joey’s sister was an abused wife who could do as she pleased, unfettered by Mob rules. Bruno now looked like an abusive husband who got what he had coming, and Joey was off the hook. Within a month, Bruno had divorced Joey’s sister. No policemen, no lawyers, no civil suit, no drawn-out divorce proceedings. The outcome of a large problem involving three lives was settled in less than an hour, because it’s agreed upon in the Mob that everyone must make a serious attempt at resolving differences. Imagine a world in which people sit down and discuss their problems, walking away from the table with a resolution that same day. This is the world of the Mafia. The Mob knows that grudges interfere with growth, and simmering disputes boil over into serious trouble. Take a lesson, and be quick to arbitrate between coworkers. Make people talk out their differences. Squash a beef before it gets out of hand, and be sure to offer fair and honest advice every time. 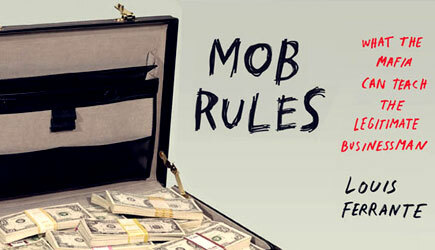 Learn from the Mob’s tireless efforts at diplomacy, the most powerful weapon in their arsenal.